There is absolutely no doubt that dramatic jungle foliage is all the rage at the moment. 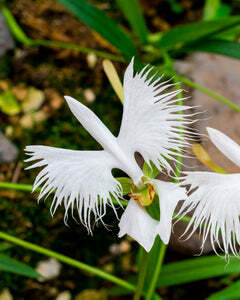 But not only are exotic, architectural plants top of the trends, these leafy delights are fabulously splendid in their own right and can be every bit as beautiful and striking as flowers. Colocasias (or 'Elephant Ears') are stepping into the spotlight this season! 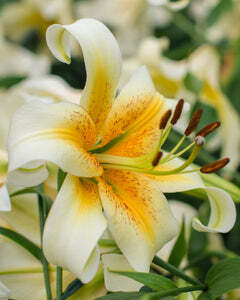 Strong, impressive clumps of upright stems flaunt the most extraordinary large, heart-shaped leaves and come in a flashy range of intense shades. Both in the home and garden, you can make a big feature with Colocasia and enjoy their colour and stately structure over a long season, as well as benefitting from the relaxing ambience that they seem to create so effortlessly. If you want to give your garden a holiday feel or a tropical theme, a border or patio container planting scheme including something big and lush like Colocasias is a must! 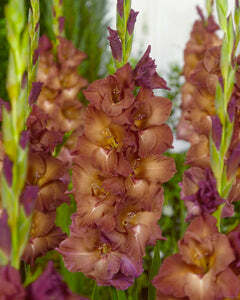 Even if you’re not going for a jungle look, these versatile plants will fit in well with most styles. 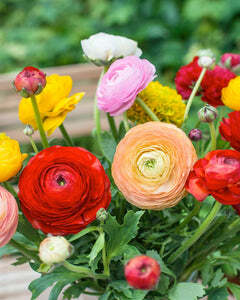 They also look great in a contemporary or minimalist style garden or terrace or modest city courtyard. Use them to create a vibrant, snazzy backdrop for bright flowering plants or let them take centre stage as an impressive standalone focal point. Colocasias originate from tropical Asia and are adapted to thrive in a warm, humid environment. 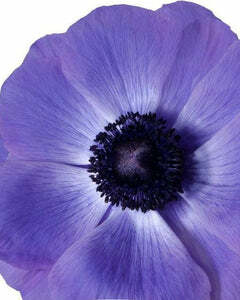 It’s entirely possible to grow them successfully outdoors in the UK – think jungle conditions, so full sun or partial shade, plenty of water, rich soil and a warm, sheltered part of the garden. Either plant them straight outside after risk of frost has passed (normally around late May) or give them a head start by starting them off in your home. You can also grow your Elephant Ears as a houseplant. Enjoying a humid atmosphere and filtered light, they’re a great choice for a bathroom or kitchen. If you really want to make the most of them, start them off in spring as a houseplant and then move them out into the garden in the summer! Colocasia grow from tubers which look like baseballs. They have ring markings and often a pointed tip or shoot on the upper side, occasionally there are some small roots on the under side. 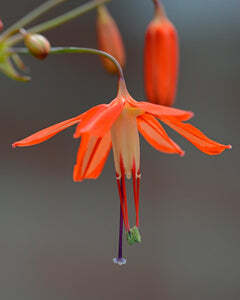 Plant with the pointed side (or the side with rings) facing upwards at quite a shallow depth so that the tip of the tuber is ever-so slightly above the soil surface. 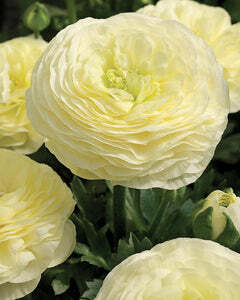 Colocasias can be started off indoors, either in your home (in a well-lit space) or in a greenhouse, or if you prefer you can plant them straight outdoors from around late May or after risk of frost has passed. 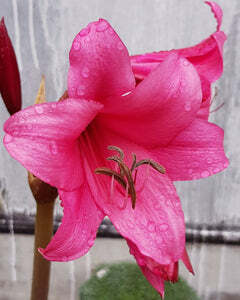 Starting them off in mid-spring in pots indoors is recommend as they’ll already be ahead of the game by the time they are planted out. 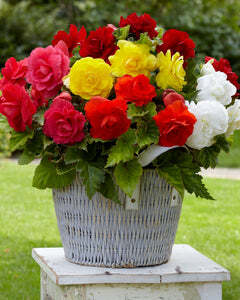 Choose a container which is approximately 8-10 inches in diameter and with drainage holes in the bottom. Fill the container to three quarters with a good-quality loam-free multipurpose compost. Position the tuber with the tip (or rings) facing upwards on the surface, then continue to fill the container to the top with more compost. Put a drip tray underneath the pot and water-in thoroughly. Colocasias prefer slightly wet or boggy conditions once in growth, but before they start to grow just ensure that the soil is well hydrated and not too saturated. 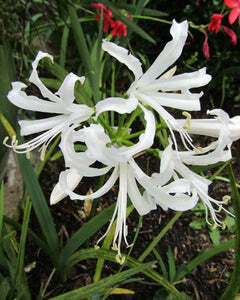 Water regularly once the shoots start to appear and try not to let the soil dry out completely. 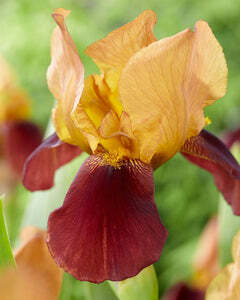 Once risk of frost has passed, position the container outside in a sunny or partially shaded, warm and sheltered part of the garden. 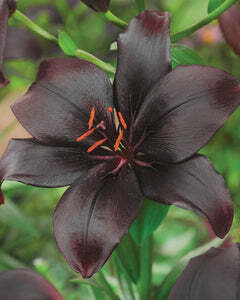 It may need potting up into a large container at that point, alternatively you can plant it out into the ground. If you choose to plant the tubers straight outside in late May, choose a sunny or partially shaded, warm and sheltered spot. If you have poor or dry soil, it’s worth incorporating a good multipurpose compost into the soil before planting to help retain moisture. Plant the tubers with the tip or rings facing upwards and so that the tip of the tuber is slightly exposed above the soil surface. Don’t forget to put a marker into the soil so you can easily find where it is before it starts to grow! 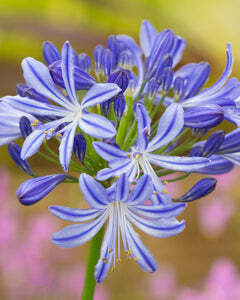 Water thoroughly after planting and keep well watered throughout the season. 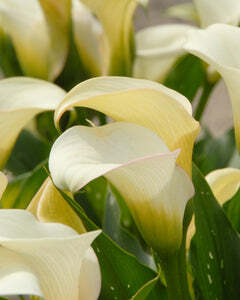 Colocasia will not tolerate frost, so if you would like to keep the bulbs for next year they should be removed from the ground just before the first frosts, have the foliage cut off and stored indoors for winter – in a tray in a dry, airy place such as a cool greenhouse, shed or garage is fine. 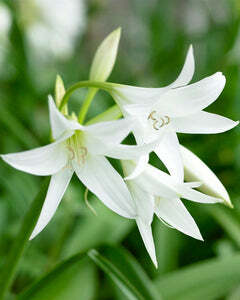 If planted in pots, the entire pot can be moved into a greenhouse or a warm part of your home. 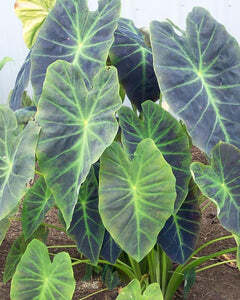 Elephant's Ear plants can remain evergreen throughout the winter if they are kept at temperatures above 21C. Lower temperatures may cause the foliage to die back during the winter, but as long as they are kept frost free they will grow new leaves the following year. 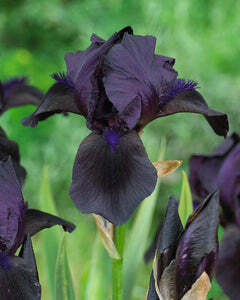 With large leaves as dark as night you can imagine what a spectacular contrast this variety creates in any planting scheme. 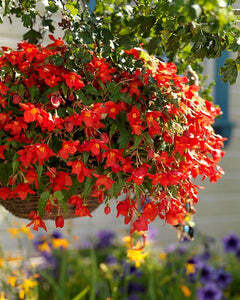 Be it with other foliage plants or with brightly-coloured flowered flowers like dahlias or begonias. A bicolour beauty with amazing mottled foliage in shades of neon green and purple with a bright green spark of chunky veins on every leaf. 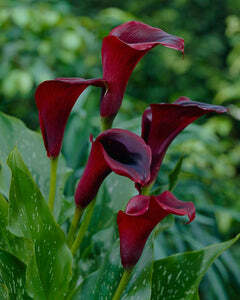 This impressive variety has its very own contrast and looks great as a feature plant or focal point. 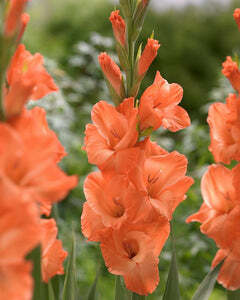 It also combines well with other foliage plants and flowers. 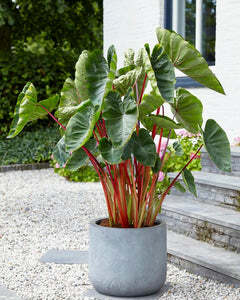 Chard-like stems in a vivid shade of pink carry the large exotic green leaves. When you catch these leaves with the sunlight shining through them they look particularly striking and glowy, showing off fantastic pink vein patterns. 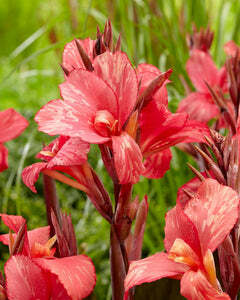 This variety is ideal for growing in pots where the vibrant stems can really stand out. 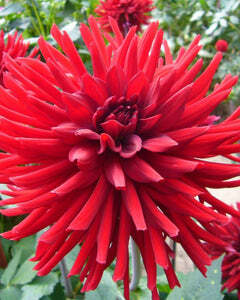 Large, brightly-coloured dahlias, such as Dahlia 'Red Labyrinth' are every bit as big and powerful as Colocasia. Both enjoying a sunny spot and plenty of moisture, these two will make a really jam-packed display with colour and contrast that lasts right through to late summer. The dainty flowers and slender stems of Bessera elegans are a complete contrast to chunky Colocasia but the two are a match made in heaven. These exotic 'Coral Drops' will shine beautifully against a sturdy backdrop of richly-coloured Colocasia. If you want to pair up your Colocasias with another leafy, architectural number, Cannas are just the job. 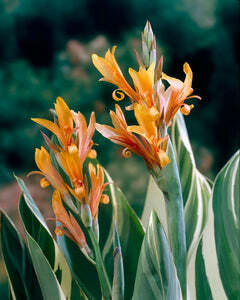 Cannas produce upright towers of large banana-like leaves in a range of colours, then topped off with a bright flower in late summer. 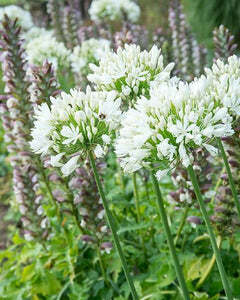 With a narrow habit, they’re perfect for planting in groups and making a really chocka looking planting scheme.